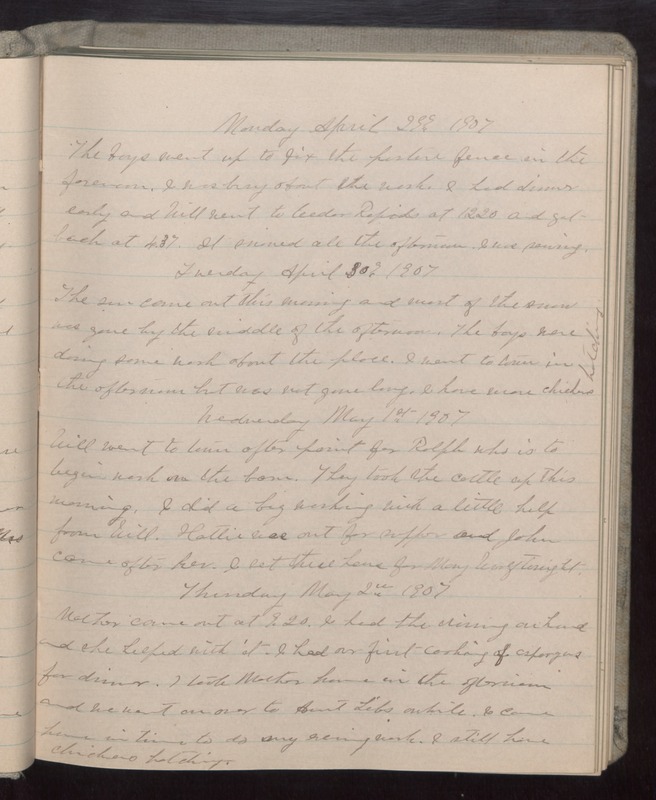 Monday April 29 1907 The boys went up to fix the pasture fence in the forenoon. I was busy a about the work. I had dinner early and will went to Cedar Rapids at 12/20 and got back at 4.37. It snowed all the afternoon. I was sewing. Tuesday April 30 1907 The sun came out this morning and most of the snow was gone by the middle of the afternoon. The boys were doing some work about the place. I went to town in the afternoon but was not gone long. I have more chickens hatching. Wednesday May 1st 1907 Will went to town after paint for Ralph who is to begin work on the barn. They took the cattle up this morning. I did a big washing with a little help from Will. Hattie was out for supper and John came after her. I set three hens for Mary Woolf tonight. Thursday May 2 1907 Mother came out at 9.20. I had the ironing on hand and she helped with it. I had our first cooking of asparagus for dinner. I took Mother home in the afternoon and we went on over to Aunt Libs awhile. I came home in time to do my evening work. I still have chickens hatching.